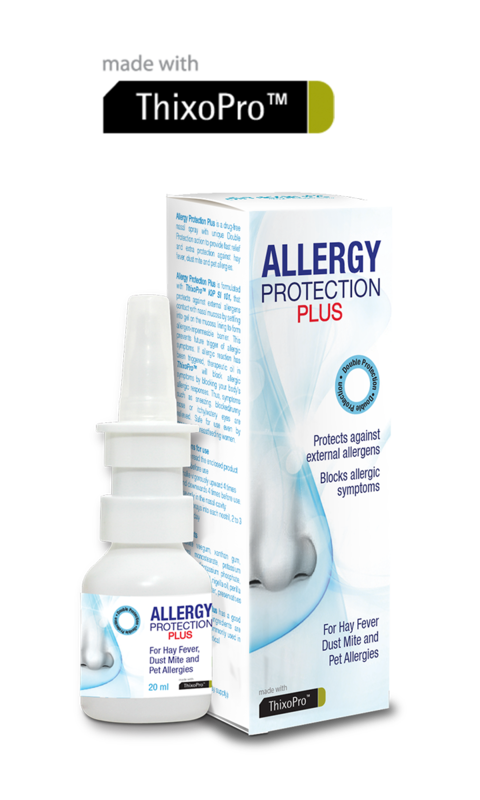 Allergy Protection is a non-drug nasal spray for children and adults suffering from allergic rhinitis. By forming an impermeable and non-porous barrier against allergens Allergy Protection stops the triggering of an allergic response. Allergy Protection is formulated with ThixoPro™ that protects against an allergen making contact with the nasal mucosa by making an impermeable barrier. Discover the science behind Allergy Protection by visiting the website. InQpharm is currently extending the range of differentiated Allergy Protection products. By forming an impermeable and non-porous barrier against allergens Allergy Protection stops the triggering of an allergic response.Allergy Protection is formulated with ThixoPro™ that protects against an allergen making contact with the nasal mucosa by making an impermeable barrier. Title:​ Efficacy of three thixotropic nasal spray preparations on seasonal allergic rhinitis assessed by allergen challenge in an environmental exposure unit. Title: Safety and efficacy of Nasya/Prevalin in reducing symptoms of allergic rhinitis. Three more innovative products are in the pipeline to offer our customers an allergy-free life.